Adrian Delia has called an emergency meeting of the PN administrative council, hours after Simon Busuttil rebuffed his invitation to suspend himself from the party. Sources told Times of Malta that council members would be meeting at PN headquarters at 7pm. They did not divulge the reason for meeting, but the rumour mill immediately linked the meeting to Dr Busuttil. Dr Busuttil wrote on Facebook that he was "available to attend and answer" any questions the council may have. PN general council president Kristy Debono told Times of Malta she backed Dr Delia over Dr Busuttil, while PN deputy leader David Agius declined to comment until after the meeting. The PN MP and former leader was stripped of his good governance portfolio and asked him to suspend himself from the party's parliamentary group by Dr Delia earlier on Sunday. The PN leader said the decision was "not personal" but that Dr Busuttil had to shoulder responsibility for having echoed allegations linking the Prime Minister's wife, Michelle Muscat, to Panama company Egrant during his time as PN leader. Conclusions of a magisterial inquiry into the claims, published on Sunday morning, found no evidence to substantiate them. Speaking at a press conference, Dr Delia said the PN accepted the conclusions of the magisterial inquiry, which exonerated the Muscat family but not those close to the Prime Minister. Dr Delia said that he would be assuming Dr Busuttil’s good governance portfolio himself on a temporary basis. When pressed as to whether Dr Busuttil had accepted the request to suspend himself, Dr Delia said that his predecessor "has the right to see the report - as everyone in Malta does - and then make up his mind”. “It’s time to move forward,” Dr Delia said. “This is not personal. The PN's credibility in the fight against corruption must remain intact." But in a Facebook post published an hour after the press conference, Dr Busuttil said he saw no reason to step aside and accused his own party leader of siding with enemy. Trump is to Putin as Delia is to Muscat. 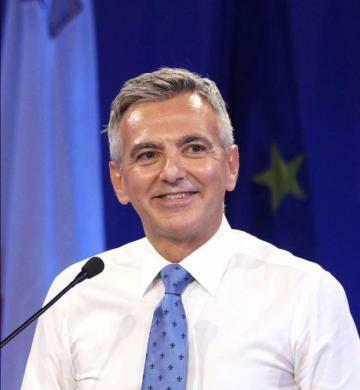 Dr Busuttil said it was the Opposition’s duty to speak up when grave allegations were made concerning the Prime Minister, and in the context of having two Panama Papers-fingered top officials, Ms Caruana Galizia assassinated, Pilatus Bank “shut down” and its chairman arrested in the US. The Labour Party welcomed Dr Delia's decision, adding that if Dr Busuttil did not take up his party leader's request to step aside, Dr Delia should take it upon himself to have him removed. "In the meantime, we wait for Simon Busuttil to resign from parliament, because he is not worthy of representing the people," the PL said. It was Dr Busuttil’s second Facebook post of the day in reaction to fallout from the publication of Egrant inquiry conclusions. Earlier in the morning, the former PN leader had dismissed the Prime Minister’s calls for him to resign from parliament as “ridiculous” and said he was only doing his job as Opposition leader when he spoke about Egrant claims. Dr Muscat tore into Dr Busuttil during a press conference about the findings, calling him "the most irresponsible politician Malta has ever seen" and accusing him of bringing Malta to its knees in his quest for power. In his statement reacting to the inquiry conclusions, Dr Busuttil said that the inquiry conclusions still shed no light on “the most important question of all” – who Egrant truly belonged to. If, he argued, the inquiry found that it belonged to Nexia BT director Brian Tonna, then the question was of whose behalf Mr Tonna was holding it. He heaped scorn on Dr Muscat’s call for his resignation, saying that the Prime Minister “should be the last person to speak of political responsibility, given that he has never assumed it despite a series of scandals during his time in office”. The former PN leader and current good governance spokesman insisted that the magisterial inquiry should be published in full, saying this was in the public interest. He said he would comment further once he had read the report in its entirety. Pierre Portelli, who was handed documentation by former Pilatus Bank employee Maria Efimova which he subsequently passed on to magistrate Aaron Bugeja, said he accepted the inquiry findings. Writing on Facebook, Mr Portelli reiterated his full faith in magistrate Bugeja and his work. "It was my choice to hand the magistrate two documents which allegedly showed who Egrant Inc belonged to," he wrote. "I never published these documents or showed them to anyone other than magistrate Aaron Bugeja." The documents Mr Portelli passed on to the inquiring magistrate were found to have been falsified by forensics experts.